Databases are a tricky part of servers: it’s easy to get started with a traditional MySQL database hosted locally on your web server. But, once your app grows bigger, the database server quickly reaches enormous resource requirements. Scaling is difficult and changing the database structure of a production system is risky. Especially for innovative products that quickly evolve based on user centered design, it can be difficult to continually adapt a traditional relational database. If new versions of your app need new columns in a table, you need to upgrade the schema – potentially causing problems for older versions of your app. NoSQL databases that store data as JSON are typically easier to adapt to new requirements. Also, scaling the server resources to match growing demand is done through a single click with cloud-based databases. 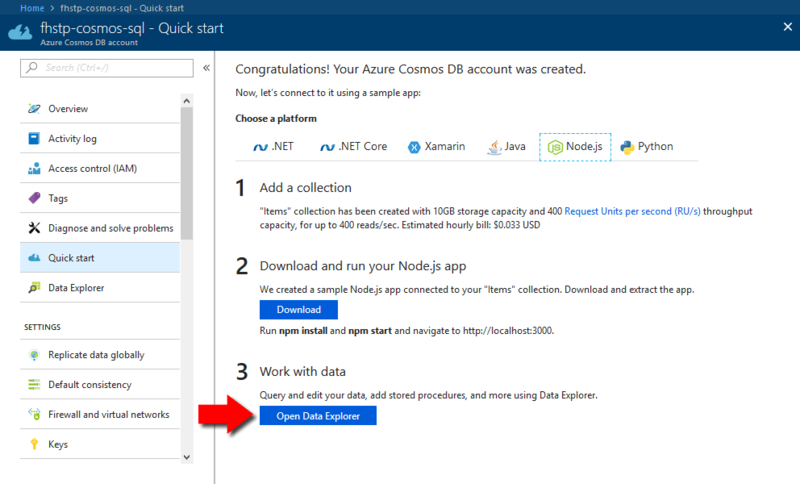 In this article, we’ll create an Azure Cosmos DB server and a simple Node.js app that interacts with the cloud database. First, create a new Node.js project using npm init. Choose the name “db-client” and accept the defaults for the other questions. Next, add the express module to simplify handling HTTP requests. Save the file. Then, start the server using “node index.js” and open “http://120.0.0.1:3000/” in your browser. It should display the “Hello DB!” message. A Cosmos DB account can have multiple databases, with their respective users and access permissions. 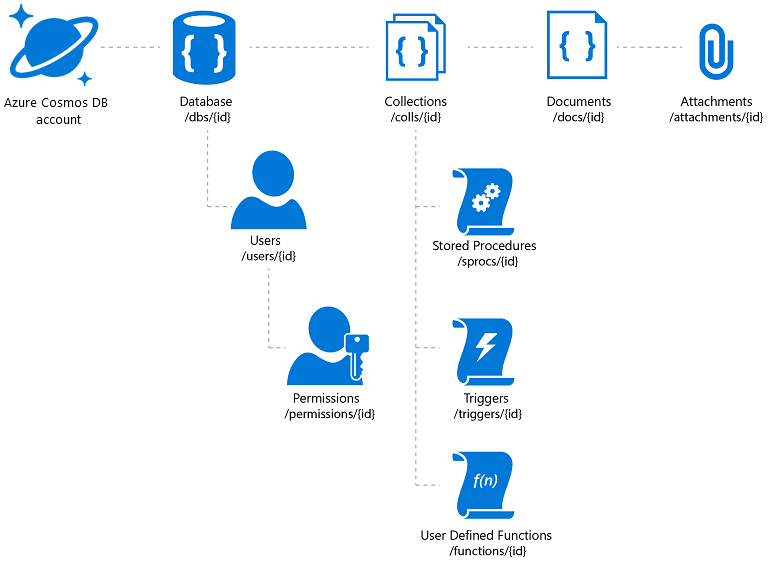 Each database is then organized into collections, which are containers for the actual documents you store. The collection can also contain logic or automated triggers for the entries. The actual documents are usually JSON files. Optionally, you could also add attachments; we don’t need these in our example. ID: up to you. It’s the access URL your app will use to load the data, so think wisely. 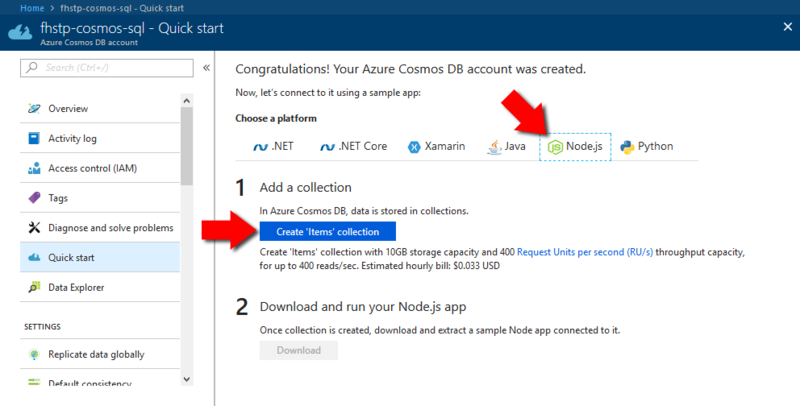 Subscription: if you don’t already have an Azure account, you can try Cosmos DB for free without the need for a credit card. Resource group: generate a new resource group and give it a name. You should group related services together. Location: closest to where the main counterpart (server) of your database is located. Right now, we’ll access the database from our own computers, so choose a region close to you. It’ll take a few minutes until your Cosmos DB is up and running. Now, it’s time to set up your database. The easiest way to generate a default structure is launching the “Quick start”. Use “Quick start” to create a default database and collection. In the wizard, select “Node.js” as the platform and click on “Create ‘Items’ collection”. This generates a sample structure. We don’t need the sample Node app. Instead, we will write the code ourselves – using the latest Cosmos DB SDK and with ES 2017 features. Therefore, skip Step 2 and go right to “3) Work with data” > “Open Data Explorer”. Once you’re in the Data Explorer, go to “Documents” (1), click on “New Document” (2), copy and paste some JSON documents (3) and then click on “Save” (4). For our example, use numeric IDs and add some other properties, like a name and a state (e.g., a number or what that person is doing right now – “building stuff”, “coding”, …). 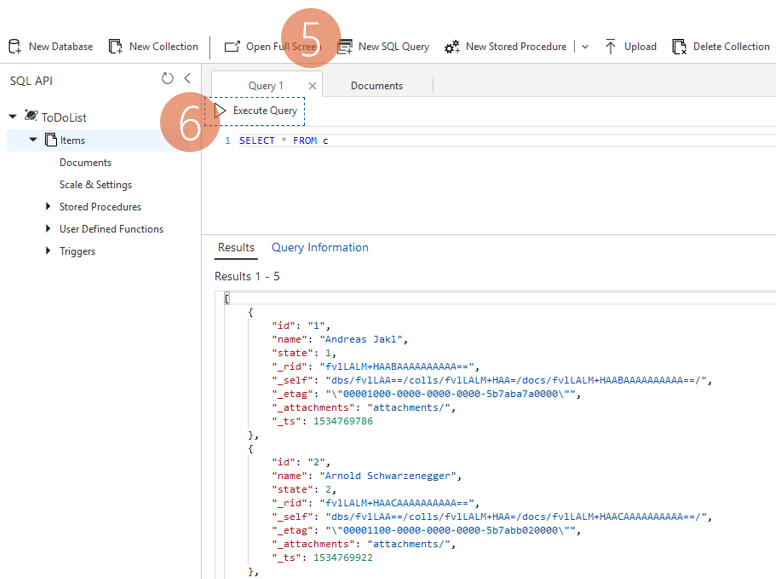 Try to add at least 3-4 different entities, so that queries make sense. Cosmos DB will automatically add some additional properties to the JSON documents (“_rid”, “_self”, “_etag”, “_attachments”, “_ts”). As you can see, they all start with an underscore. Most of these are generally not relevant to you. The internal timestamp is stored in “_ts” with Unix Timestamps. First, add the node module for the database client. If you’re interested, its source code is available on GitHub. Next, make sure you get your keys and the URI to access the database. 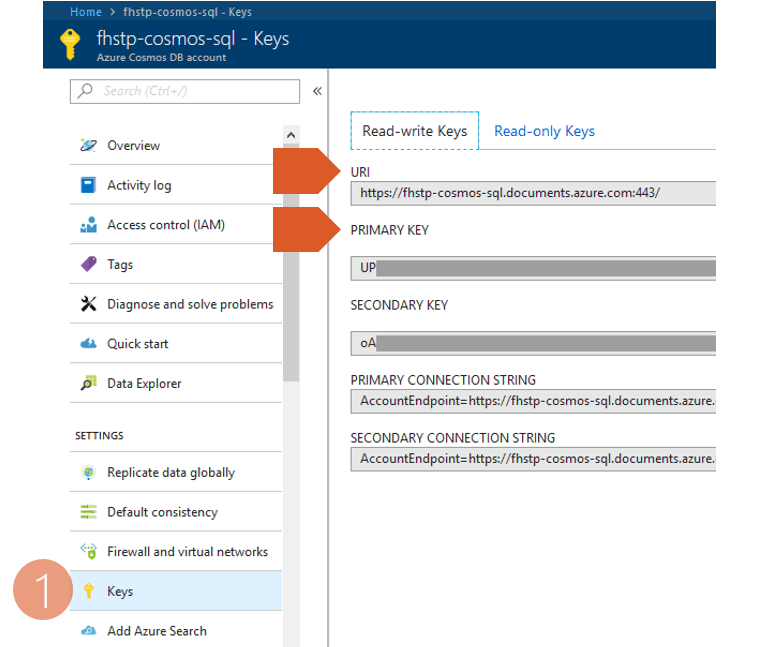 These can be found in the “Keys” section of the Cosmos DB in Azure (1). Copy the “URI” and the “Primary Key”. Retrieve the primary key and the URI of your Cosmos DB. Go back to Visual Studio Code. We’ve already added a route for the root path (‘/’). Note that the handler Arrow Function is marked with the async keyword. This is necessary, as database operations are asynchronous and we will use await to keep the code clear and easy. As we used the quick start to generate a database and a container for us, the default names are “ToDoList” and “Items” respectively. The next few lines simply configure everything we need to access the data. Make sure you replace the endpoint URI and the authkey with the values you copied before. The final part instantiates the Cosmos DB client based on the connection configuration defined before. Any interaction with the Cosmos DB can cause an exception. The internet connection might be down, your access credentials could be wrong. Therefore, we surround the database interaction code with try / catch. In the catch-block, we log the error to the console. Additionally, we send the “Internal Server Error” (500) code to the user’s browser, together with the main text of the error message. But let’s stop talking about errors, let’s get to the code that could potentially cause them! Line 3 is a risky one: we try to open a reference to the database by specifying its ID. In case the database doesn’t exist yet, we automatically create it. In many real-life scenarios, you’d probably want to report an error in case the database isn’t here. That would be a serious issue for your app. As we’re just exploring the Cosmos DB, it makes sense that our client creates the database in case anything else went wrong during the previous steps. Corresponding to the Cosmos DB architecture overview, after retrieving the database, we need to get the container. 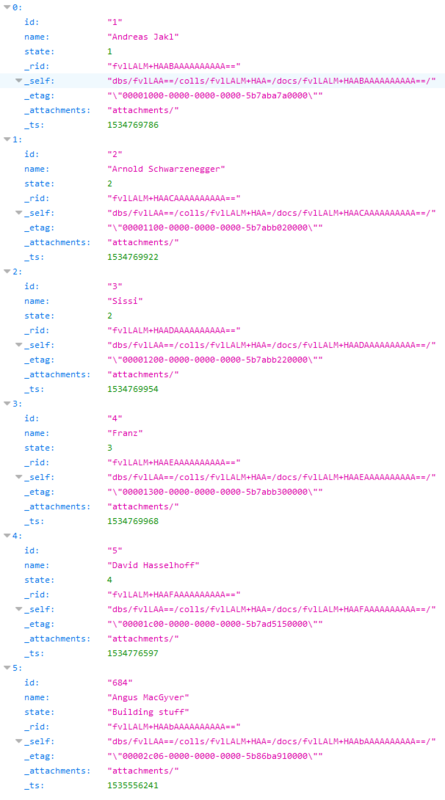 The container then contains the documents (JSON items). After connecting everything, this is the first exciting part: adding an item to the database from code! First, the code creates a random item ID. Next, the variable documentDefinition collects all items that should be part of the JSON document. Also, the item creation is asynchronous. Thus, we use the await keyword again to ensure that our code only continues execution once the results of the operations are in. 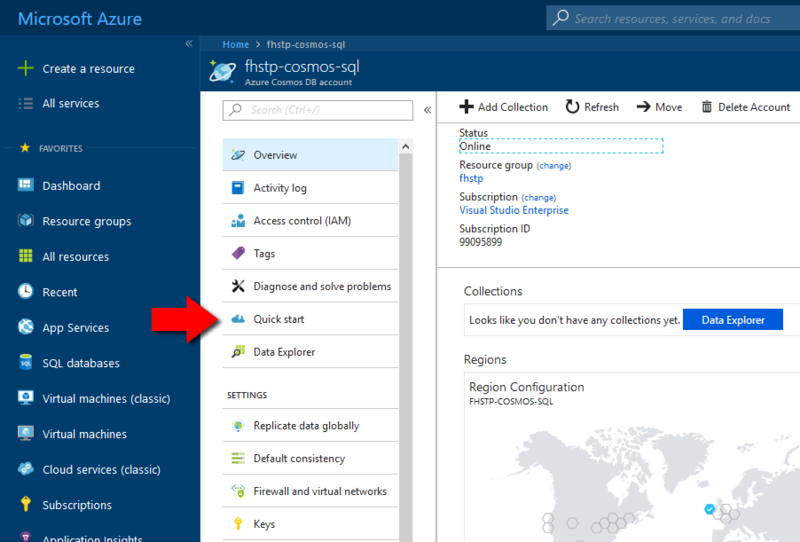 If everything worked fine, you can immediately go to the Azure Data Explorer to see your new item. That’s helpful to check the results immediately! Of course, now that we created the item, we also want to see how we can retrieve it again from code. This time, we’ll use an SQL query. 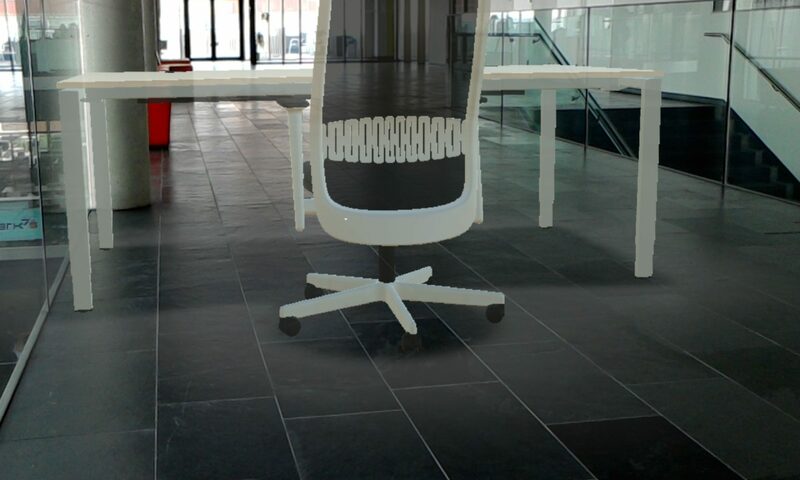 They work the same way as in our previous tests through the web portal. The code to retrieve the item works. However, it’s not the safest variant and you shouldn’t do it that way. Why is that? Somehow the new data needs to be transmitted from the user or a sensor to the Node.js server, which then interacts with the database. A usual way to do so for simple updates is the GET parameter. Quick recap of GET requests: the parameters are sent as part of the URL. The first query is added to the URL with “?”. Multiple query strings are then separated with “&”. It’s typical to have a format of “field=value”. Special characters are encoded through URL encoding. As you can see, the parameter is directly inserted into the SQL query. Which in turn then says: “get me all the items from the database where the name is empty or 1=1”. Of course, “1=1” is always true, so the query will ultimately return all items from your database – even though you only intended to get one! If you directly show the results to your users, they’d see everything in your database. The most straight-forward way to prevent SQL injection attacks is to escape data strings before feeding them into the SQL queries. This turns characters with a special meaning into escaped variants. Thus, the user would be unable to add new code to your SQL query – the parameter would always remain a simple string. A “ character is transformed to \”, or the ‘ char to \’. Escape data strings to prevent SQL injection. All the strings are highlighted. In the second variant, the parameter stays one string and doesn’t add a second SQL query condition. That sounds fine, and it is pretty safe. But, it’s easy to forget escaping parameters in code! Especially in more complex application where data gets sent between services, you often don’t know if the data has already been escaped or not and if you should do it now. There is a better way: you parameterize the SQL query. Instead of directly constructing a string that contains the whole SQL query and sending that to the server, you use placeholders. These placeholders are marked with the @ character in the SQL query. Then, you supply the parameter values through an extra array. The API transmits those separately to the database server, which then knows that your username is only a single value and can’t magically contain additional SQL commands. Your code would look like this. I highlighted the three major items in different background colors so that it’s easier to see where they’re used. Do we need to use this method for our sample code? Sure, you can. As we generated the item ID ourselves in code and use that directly, there’s no way for the user to modify it, though. But it’s always good practice to at least escape the values. This prevents issues if the string should contain any special characters that you didn’t think about. The first part deletes the item by calling the delete() function on the item that is retrieved through its ID. To confirm, the API returns a response that contains the ID of the deleted item. Next, through the readAll() function, we query all items from the container and send these as the response to the user’s web browser. That’s quite a lot! In case something didn’t work on your computer, check the finished code example on GitHub. To further experiment, I suggest combining all the information from this article to create a solution for sensor data logging – e.g., for logging regular heart rate or machine data measurements. Next, add a new JSON item to the database containing the data. Use the parametrized variant of the SQL query to prevent SQL injection attacks. Additionally, add a timestamp to the stored data (using the Node.js server’s time) when creating the item. Once you have that running, you should have a good understanding of how to work with a cloud-based NoSQL database using traditional SQL-based queries!